The Album offers a pictorial history of the rapid transit cars that have carried passengers between downtown Cleveland and suburban Shaker Heights. The Album offers a pictorial history of the rapid transit cars that have carried passengers between downtown Cleveland and suburban Shaker Heights. 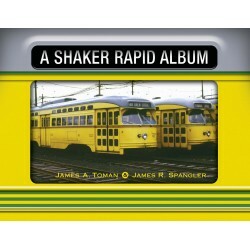 Drawing on their extensive collections of Shaker Rapid photos, co-authors Jim Toman and Jim Spangler trace the different kinds of cars used on the line since 1920, from the 1200-series center-entrance fleet, through the colorful PCC car era, to the current fleet of Breda LRVs which have operated the line since 1982. Each photo section is preceded by a short essay giving the basic history of the various fleets. shows the cars in all kinds of weather and in many different paint schemes. The “rapid” made the development of Shaker Heights possible, and it continues to be one of the most distinctive features identifying that classic Greater Cleveland suburb.